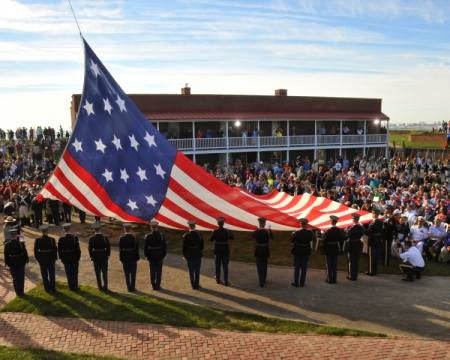 At precisely 9 a.m., guns blasted and the crowd of onlookers fell silent as service members raised a 30-foot by 42-foot replica of the flag that 200 years ago inspired Francis Scott Key to write "The Defence of Fort McHenry," which would later become America's national anthem. "It is a great pleasure for me to be here at this historic site and historic city of Baltimore as we celebrate the 200th anniversary of our Star-Spangle Banner," said former Secretary of State and retired Army Gen. Colin L. Powell, the event's guest speaker. The American flag is "a piece of cloth I have loved all my life and have served under for over 40 years,' Powell added. The special ceremony capped a weeklong series of events at the fort for Baltimore's Star-Spangled Spectacular, a celebration commemorating the bicentennial of the Battle of Baltimore and the national anthem. The fort played host to a number of special events and activities including commemorative ceremonies, living history demonstrations and interpretive programs during the Star-Spangled Spectacular. The city's celebration, which concludes Sept. 16, also includes visits by more than 30 ships from the U.S. and foreign nations, as well as an airshow performance by U.S. Navy's Blue Angels. Note: The above U.S. Coast Guard photo was taken by Petty Officer 1st Class Pamela J. Boehland.